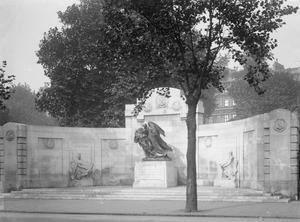 A stone curved screen with a bronze sculptured group on a square plinth in the centre. The figures are of a women and two children carrying garlands. On the screen are low relief classical depictions of justice and honour. WESTMINSTER COUNCIL 1999: English Heritage. The Times 12 May 1919 p.12; 13 Oct. 1920 1919: London County Council grants permission for memorial. 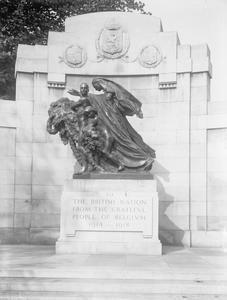 1920: Report of presentation of memorial to Great Britain by M Leon Delacroix, Prime Minister of Belgium. It was accepted by Lord Curzon, Foreign Secretary, and unveiled by Princess Clementine of Belgium.